Haworth Tompkins’ Everyman Theatre was profiled by the RIBA Journal when it was rebuilt. It’s darkly congenial and feels comfortably like it’s been here for years, but it’s new. Why does it feel so familiar? Main foyer of the new Everyman: pale boardmarked concrete, sawn oak floors, set off by Antoni Malinowski’s ceiling drawings. 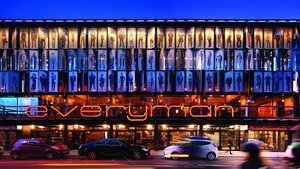 Given its track record in theatre architecture – from the late 1990s revamp of the Royal Court to its ongoing re-ordering and extension of the National – it comes as a surprise to find that the Liverpool Everyman is the first permanent newbuild Haworth Tompkins has done in this sector. Everything else has been adaptive or temporary. But here’s the thing: the Everyman does not feel especially new. It feels pre-used, familiar. This is partly because we are now accustomed to the Haworth Tompkins architectural palette and ‘neither new nor old’ approach to theatres. HT’s love of self-finished materials, of darkness, of rough old stuff left revealed and celebrated, a desire to show the sinews of the building rather than box in and plaster over. Above all, a way of working by implication rather than overtness – a crepuscular glimmer from glazed bricks behind the bar rather than Folies Bergère mirrors, that kind of thing. Every detail considered and designed including furniture, signage and slightly Heath Robinson light fittings. The auditoria seats are always good; and there’s the involvement of artists, including long-time collaborator Antoni Malinowski, whose richly-pigmented work adorns the foyer ceilings here. This is a way of working that has served them well. When I arrived and sat down in the Everyman’s foyer, I felt immediately at home. It’s not a formula, though it’s certainly a style. It’s allusive: things often suggest other things. In this case, those other things are the industrial buildings of Liverpool with their loading bays,rough iron and timber doors, tough red brickwork. And – hang on, from outside when you look across from the steps of Gibberd’s Roman Catholic Cathedral at the end of the street – is that a row of ships’ funnels on top? This is a naturally-ventilated 400-seat flexible-configuration theatre, rated BREEAM ‘excellent’. The four cylindrical air extract chimneys are in brick with a subtle spiralling pattern, topped with a band of dark metal louvres. Enough like ships’ funnels to make you wonder. But that’s where the expression of the natural ventilation system ends – it’s not fetishised, or even apparent, elsewhere. Steve Tompkins consulted the architects of the two previous new naturally-ventilated UK theatres who happily shared their experiences – Alan Short (Manchester’s Contact Theatre) and Wright and Wright (Hull Truck). The exposed boardmarked concrete in the foyers has a creamy colour that derives in part from its use of a high percentage of cement replacement ash. Like the use elsewhere of natural cork flooring, this, plus its thermal mass, is another BREEAM plus point with a good aesthetic consequence. Artistic director Gemma Bodinetz admits she issued contradictory instructions: on the one hand she wanted people to feel a connection to the old Everyman, on the other she wanted a total transformation of what the theatre could do. As Tompkins wryly remarks, since this project took 10 years from first appointment, there was plenty of time to refine the concept and the details. Three features of the previous Everyman are present and correct in the new one. First is the auditorium, which had an unusually large thrust stage with shallow rows of seating around it. It shouldn’t really have worked – it’s in no textbook of best practice – but it plainly did, so its dimensions have been replicated and two levels of seating provided. Second – the large basement bistro with its compartmented areas, which sometimes felt like a staff canteen for Liverpool University’s nearby architecture school. This too is repeated, though more freely; with some daylight creeping in through pavement lights, a section that can be closed off for live music performances, and some very HT lighting – dozens of little counterbalanced mirrored shades, the wires running on pulleys across the ceiling to rows of lead-filled copper-pipe counterweights on the walls. And thirdly, the famous 1970s lower-case red neon ‘everyman’ sign outside, rethought by artist/typographer Jake Tilson, now casts its glow back into the first-floor bar as well as out into the street. There’s a fourth thing too, a material. When the old theatre was demolished – it had been a 1970s frontage grafted onto the 19th century Hope Hall Chapel – 25,000 of the chapel’s bricks were salvaged, and these have been re-used very visibly throughout the interior, making new walls in front-of-house and auditorium alike. Obviously this recycling boosts the new building’s eco-credentials and, again, thermal mass, but as importantly it provides a tangible link back to the old place. It’s been well done: you could think you were in a conversion again. Tompkins’ use of materials such as rough-sawn oak floorboards and sliding screens made of painted left-over concrete shuttering timber adds to the sense of history. Learning from theatre practitioners perhaps, he is making permanent scenery. House of cards: Each aluminium shutter on the facade bears a water-cut portrait of a Scouser. Overlooking the foyer is an events room which can be closed off: the sliding screen is made of lengths of timber used in the concrete shuttering. All new, but channelling the old: Reclaimed bricks from the old chapel/theatre line the auditorium. Gold/bronze seat fabric also recalls the previous theatre. Steamship air handling: the theatre is naturally ventilated through these distinctive brick chimney stacks. At the rear, new brickwork, angled dressing room windows and – at last – a proper truck-sized get-in. What you won’t be aware of from the audience are all the technical improvements: there’s now respectable flying-space for scenery, proper tension-wire access beneath the technical grid, a stage in modular sections with a deep sub-stage beneath, big wardrobe and wigs workshop, good daylit dressing rooms, a proper backstage where scenery can be built, and a full size get-in that the theatre never had before. The site now extends right back to the street behind, where the theatre expresses itself through a new brick-built range with dressing room and green room in it, and stage door below. In new local red brick with dark mortar, it sits well with its neighbouring industrial buildings. At one point the theatre management considered buying more land to get a larger footprint: Tompkins persuaded it to keep things tight, in the tradition of city theatres, and focus spending on the things that mattered. There seems to be plenty of room anyway , to the extent that there is also a full-size rehearsal room above a community studio of the same size, a writer’s room and function room overlooking the foyers, separate café and bar as well as the basement bistro, and even some so far unallocated office space on top. Tompkins started to worry that the building might look too big from outside, and designed a set-back bay at its south end to shorten the apparent length of the main facade. That facade is interesting. It’s largely glazed and faces south-west (though with a large former convent opposite), so there was a need for shading. At the same time the theatre needed to advertise itself. Well, the famous neon sign does a lot of that job, which allowed for a different approach. The theatre ran drop-in photography studios across the city for its supporters. A selection of these photos of people by Dan Kenyon – the Everyfolk, you might say – was scanned and reproduced in watercut semi-abstract form on solid aluminium moveable shutters. There are 105 such portraits, one to each shutter, each of which can be manually moved from inside via a gleefully mechanical system which itself gives depth and texture to the facade. So the people of Liverpool become the facade of the Everyman. It’s a corny concept of course, but it’s deftly handled. And anyway, a theatre IS all about people, so why not?